Explanation: A comet-like tail of glowing gas, 200,000 light-years long, streams from galaxy C153 as it plunges through galaxy cluster Abell 2125 at nearly 8 million kilometers per hour. Itself a member of the giant cluster of galaxies, C153 may once have been a spiral galaxy like the Milky Way. 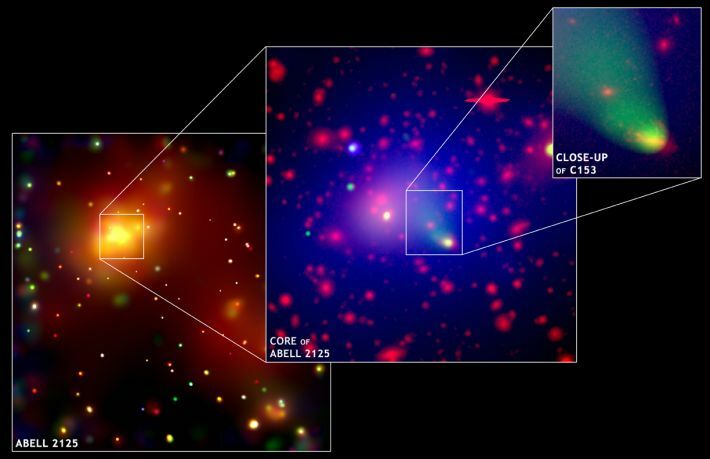 But this remarkable series of images, false-color composites of x-ray and optical data, zooms in on the galaxy's fate. A headlong passage through the hot intracluster gas in the central regions of Abell 2125 is seen to be stripping C153 of its own star forming material and distorting its shape. As other galaxies in the cluster suffer a similar fate, the hot gas collecting in the cluster's core should become enriched in heavy elements. The violent spectacle was taking place about 3 billion light-years from Earth and is thought to illustrate a common process in the cosmic evolution of large clusters of galaxies.